Analyzing gender relations within "Mad Men"
Essay from the year 2014 in the subject American Studies - Miscellaneous, grade: 1,7, Humboldt-University of Berlin (Department of English and American Studies), course: American TV Serials: The Wire, Mad Men, Homeland, language: English, abstract: In the following research paper I will focus on the American TV serial "Mad Men" (AMC, 2007-now). In the course of our class we discussed several aspects of the award-winning show and I was most fascinated by the sexual politics and the dynamics of the female-male relationships of the characters. Therefore, the focus of my work will be on the gender relations within "Mad Men" and more precisely on the character of Betty Draper. It is my aim to analyze the character of Betty within the patriarchal structures she finds herself in (chapter 3) and this analysis will be the main part of this paper. Prior to Betty&apos;s analysis, chapter 2 serves to clarify the concepts of Second-Wave Feminism and Patriarchy since they provide the historical background and theoretical framework. The last part of the paper will be the conclusion, followed by a list of the cited works. 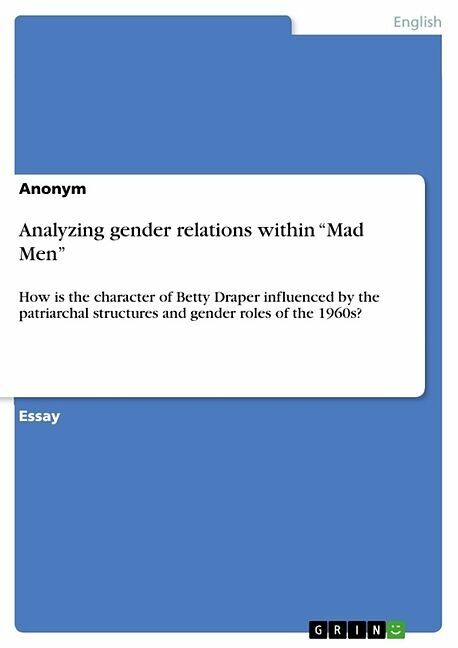 I hope that this term paper contributes to answering the question of how the character of Betty Draper is influenced by the patriarchal structures and gender roles of the 1960s. Finally, it is to be said that I will exclusively focus on Season 1 of "Mad Men" and that given the 6-7 page maximum a more in-depth analysis would be possible. Titre: Analyzing gender relations within "Mad Men"